This factsheet tells you how to care for your feeding tube and how to take your feed and medications via your tube. Your dietitian needs to fill in parts of this factsheet. 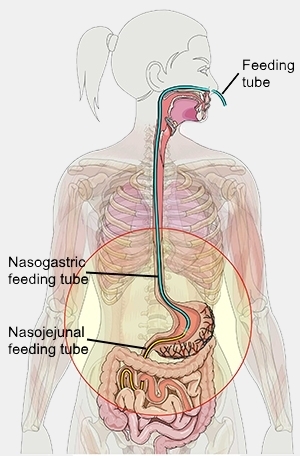 What is a nasogastric (NG) or nasojejunal (NJ) tube? This a tube that goes through your nose and into your stomach (NG) or jejunum, a part of your small intestine (NJ). The tube allows you to take special liquid food (feed), medications and fluids if you can't meet all of your nutritional needs by eating normally. You have a _______________________________ tube. If you have an NG tube, there are two types of tube feeding, bolus feeding using a syringe, and pump feeding. Both types of feeding are described in the following sections. Your dietitian will decide which type of feeding is best for you. If you have an NJ tube, you can only use pump feeding. Always wash your hands with warm soapy water before handling your feeding tube and feed. Check the expiry date of the feed before you use it. If it has expired, throw it away. Your feeding tube has centimetre (cm) markings. Always check that the same cm marking is nearest your nostril before starting to tube feed. Your tube marking is _______________ cm. Sit so your back is at least 30 degrees above horizontal when you tube feed and for an hour after feeding. This helps the feed go into your stomach and not your lungs. Flush your feeding tube with warm water before and after you tube feed, and before and after you take medications down your tube. If you have safe drinking water, you can use tap water to flush your tube. Otherwise, use boiled, cooled water. If you have a jejunal tube, always use boiled, cooled water to flush your tube. prescribed medications (see below for how to put medications down your feeding tube). This is when you have a set amount of feed at specified times during the day. This is similar to having meals at meal times. Your dietitian will give you a bolus tube feeding plan with the details filled in. Collect all the equipment you'll need (a 60 mL syringe, a measuring and pouring jug, and your feed). Check the expiry date on the feed and shake it well before opening it. Remove the cap on your feeding tube. Remove the plunger from the syringe and connect the syringe to your feeding tube. Hold the syringe upright and pour the prescribed amount of warm water into the syringe to flush the tube. Pour the prescribed amount of feed into the syringe. Allow the feed to flow into the feeding tube until it has gone. Pour the prescribed amount of warm water into the syringe to flush the tube. Disconnect the syringe and close your feeding tube with the attached cap. Pump feeding uses a feeding pump that continuously delivers a set amount of feed through your feeding tube over a set amount of time. Your dietitian will give you a pump tube feeding plan with the details filled in. Your nurse, dietitian or a nutrition company representative will teach you how to use your feeding pump. They'll also give you written instructions. Your dietitian will give you a feeding pump and giving sets when you're discharged from hospital. Feed for pump feeding comes in ready-to-hang bottles like the one shown in the picture. The hospital pharmacist will review your medications before you go home to make sure you can take them through your feeding tube. Use the main port of your feeding tube for medications. Use the bolus feeding method (explained above) to put medications down your feeding tube unless your dietitian or nurse advises otherwise. Flush your tube with 20 mL warm water before and after giving medications. This helps to prevent your feeding tube from blocking. If you have more than one medication, take each one separately. Flush your feeding tube with 10 to 15 mL of warm water between each medication. Finely crush each solid medication and mix it with 10 to 15 mL of water before putting it down your feeding tube (a mortar and pestle is best for this). You can take liquid medications down your feeding tube without diluting them. After feeding, wash the syringe with mild dishwashing detergent, rinse thoroughly and leave it to air dry. Place the syringe in a clean zip lock bag or a clean container with a lid. Store it in the fridge to prevent it being contaminated by bacteria. You can use each syringe for about two weeks. Giving sets can only be used once. Discard them after you've used them for 24 hours and don't reuse them. Cover open cans or bottles of feed and store them in the fridge. Throw away any open, unused feed after 24 hours. You can use ready-to-hang bottles of feed for 24 hours. Throw away any unused feed after 24 hours. Your feed should be at room temperature when you use it. If it has been in the fridge, leave it for 30 minutes before using it. Your feeding tube may block if you don’t flush it regularly or you don’t take your medications correctly. You can stop your tube from blocking by flushing the tube with warm water before and after each feed, before and after giving medications, and every three to four hours during continuous pump feeding. if you've repeated this three or four times and you can't unblock the tube, contact your GP. If your feeding tube comes out, contact your GP. Taking good care of your mouth is important, especially if you can't eat or drink. regularly check your mouth and tongue. Redness, or yellow or white patches on your tongue may be a sign of infection or thrush. In this case, see your GP. For syringes, contact your community dietitian who will arrange an ongoing supply from the Canterbury DHB Supply Department (see below). When you're discharged from hospital, the hospital dietitian will give you 10 nose plasters. When you need more, you can order them from your local pharmacy. Nasofix is one of the brands you can use. You can also ask your community dietitian who may be able to organise an ongoing supply. For giving sets, contact your community dietitian or phone the Canterbury DHB Supply Department (see below). Give as much notice as possible. Let them know if you can't collect the giving sets as they can courier them to you. There's no charge for giving sets or delivery. If you're under the care of the Ashburton Hospital dietitians, phone the Ashburton Supply Department (see below). You'll need to collect your giving sets from the Supply Department. Your hospital dietitian will organise your feed when you first go home. After this, your community dietitian will organise it. If you need to contact your feed supplier because your feed hasn't arrived, use the contact details below. Hours: Monday to Friday, 8 am to 4 pm. Hours: Monday to Friday, 10.30 am to 2.30 pm. FreeGo pump (Abbott). Phone 0800-738-090. Flocare Infinity pump (Nutricia). Phone 0800-222-430. Kangaroo Joey pump (Cardinal Health). Phone 0800-522-400. Abbott and Nestle feed (via Health Works Pharmacy). Phone (03) 351-8633. Written by Nutrition & Dietetics, Canterbury DHB. Adapted by HealthInfo clinical advisers. Page created April 2018.